My throat is in that tight, choking grip that comes when you’ve just cried or are holding back the tears. There is so much noise everywhere we turn – in the media, in Facebook feeds and Twitter streams, in classes and books and everywhere more words. This world is loud, mighty loud, and I haven’t right known what to say. So I’ve pulled back. I’ve laid my head down an hour earlier each night. I’ve said no to movie dates and study groups and found my way to a blanket and a quiet minute in my room. With everything spinning around, I’ve hit pause and slowed down because I’ve grown so dizzy. If you were to sum up how you are or even just your week in one word, what would it be? You might say full, happy, overwhelming, or surprising. I would say I’m tired. In fact, for the past two months my word would be tired and tired again. And so I’m here, with throat tight and bags under my eyes from nights full of nightmares. There are rarely tears and it isn’t even sadness. It’s a weight pressing down and down I drown. We can doggy-paddle for a long time, sucking in air while trying to kick and squirm and reach the shore. It’s been dark, y’all. And it’s been noisy. The last thing I want to do is add to the noise, but as I sat on this Sabbath Sunday, homework put away and mind focused on the sermon this morning, I felt compelled to write where I’m at before telling you what I’ve seen. There are questions and walls up and doubts I don’t know how to put words to, but there is a certainty and an assurance of Who He is. 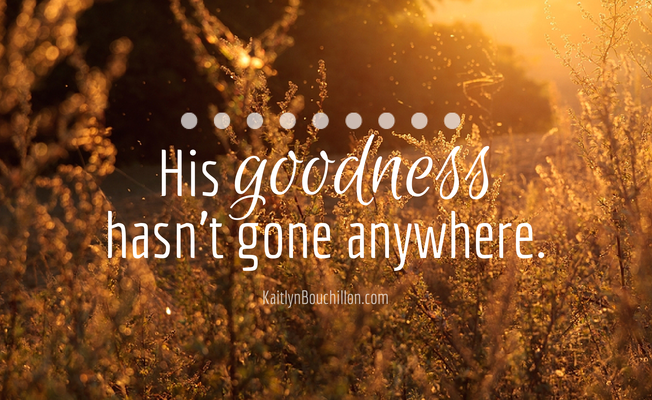 His goodness hasn’t gone anywhere. He doesn’t abandon His people. He does not walk away. He does not un-choose us. He does not, He does not, He does not. Sometimes the enemy attacks and we are left wounded and bleeding – but He is Healer. Sometimes there isn’t an explanation for it – but we know He hasn’t gone anywhere. And I’ll be honest with you, “it happens to the best of us” is both trite and inaccurate. Because sometimes it just plain happens and it’s just plain hard. It can feel like a season of groping in the dark, hands straight out in front of you, searching aimlessly for the light switch. What the enemy means for evil can be turned for our good. It will be turned for our good. He is always Faithful. Listen, let me make this clear: I am not doubting my salvation. I know I am His beyond a shadow of a doubt. But boy am I thankful for a pastor who doesn’t shy away from the hard conversations! You can listen to the full sermon here [likely to be updated tomorrow with today’s sermon], but as he spoke of the covenant God made to His people I was struck by this promise-keeping, all-knowing, forever-loving God. In the Old Testament, the most secure covenant was a blood covenant. This would be made by splitting animals in half and laying them in two rows. Then, the two people entering the covenant would grasp hands and walk between the animals together. It sounds gross and absolutely disgusting because it is. But it was meant to signify that if one person didn’t uphold their side of the covenant, they were saying “may it be done to me as it was to these animals.” When God entered into the covenant with Abram, He put Abram to sleep before making the covenant. God promised both sides of the bargain. In His promise-keeping, all-knowing, forever-loving way, He knew that we would never be able to keep our promise. We would fail, we would falter, and we would never uphold our side. The penalty would be ours to pay. And so God promised. Both sides. And then He paid the penalty. Jesus came, His body broke, and the veil was split in two. 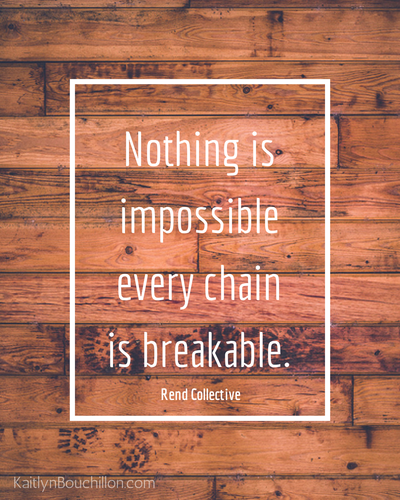 He broke so that all things could be made new. He is a promise-keeping God to a promise-breaking people. He is working in each season, even when the world is noisy and He feels like a whisper. That still, small voice is present and active. We are more than conquerors in Christ, through Christ, with Christ. Hold on, friend. Hold on to what you know is true in the light when you can not see it in the dark.And if there comes a time when your grip loosens and you feel yourself falling, rest in knowing this promise-keeping God has got you tight and sure. And now to him who can keep you on your feet, standing tall in his bright presence, fresh and celebrating—to our one God, our only Savior, through Jesus Christ, our Master, be glory, majesty, strength, and rule before all time, and now, and to the end of all time. Yes. Thankful you shared these words here, but more thankful for the way you lead and teach each week. You are way too kind and such an encouragement to me and so many others. I am the blessed one! Truly! Just to be a part of all God is doing amidst Shades is amazing.